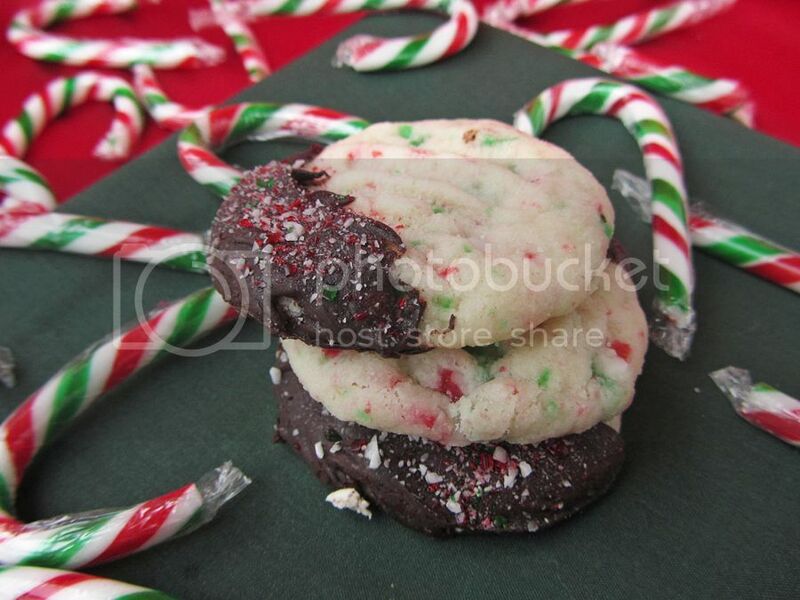 Even though I don't like candy canes, I love them in cookies and other baked goods, and lately I feel like I've been putting candy canes and peppermint extract in everything! 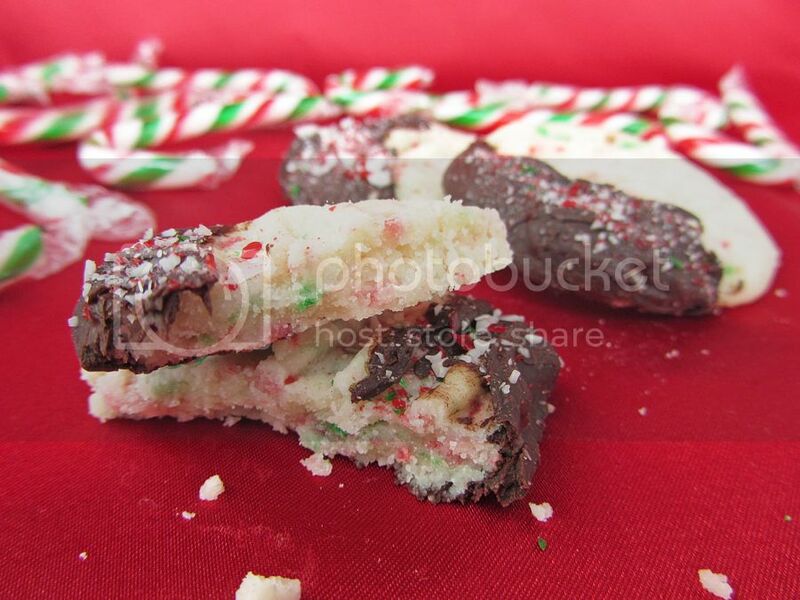 And as my favourite cookies are shortbread, it didn't take long for me to think of making candy cane shortbread! My first try at candy cane shortbread turned out to be more of the crunchier shortbread than the melt-in-your-mouth variety. Still good, but not quite what I wanted. So I tried again with this recipe and ended up with just what I wanted! 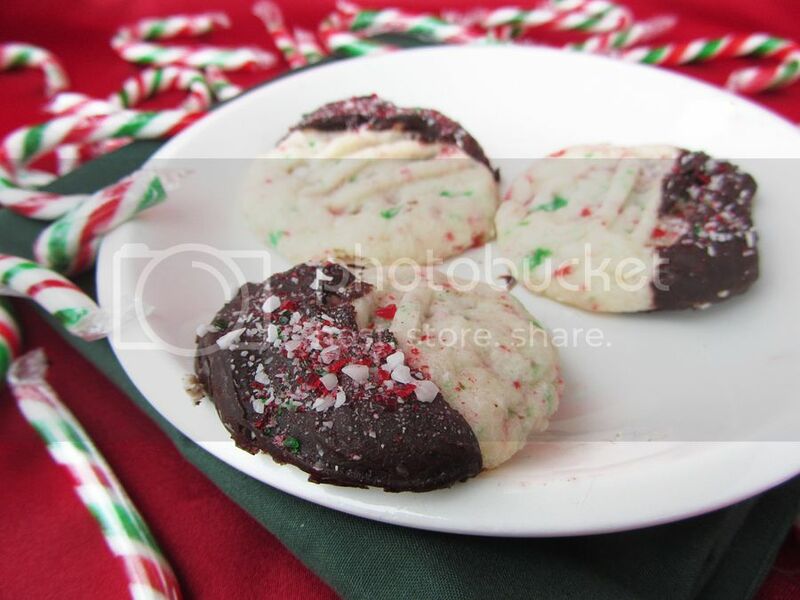 These are just a standard buttery shortbread cookie with crushed candy cane sprinkles throughout the dough, along with a dip in dark chocolate and sprinkle of candy cane for a festive chocolate peppermint flavour. They're really easy to make and look so pretty with all their red and green and sparkles! I cannot believe there's only about a week until Christmas! I just got back from a little weekend trip and realized that I still have about a billion recipes I had planned on trying out before Christmas, I've only bought about half the gifts I need to, and almost none of the ones I have purchased have arrived yet, as I ordered most of them online. You'd think I'd have learned my lesson from last year when a couple of my gifts didn't arrive on time, but I just can't resist the convenience of online shopping! So I'm going to be a busy girl this week baking, shopping, and constantly checking the mail for parcels, but hopefully I'll be able to squeeze in a few more recipes to share with you guys! In a large bowl, beat the butter until light and fluffy. In a separate medium bowl, whisk together the flour, cornstarch, icing sugar and salt. Add the dry ingredients to the butter in two additions, blending after each to combine into a soft dough. Stir in the candy cane. Refrigerate mixture for at least 30 minutes. Preheat oven to 300°F. Roll cookies into 1” round balls and place on cookie sheets lined with parchment paper, a couple of inches apart. Note that the parchment paper is important – I tried baking some on an ungreased cookie sheet and some on Silpat and both spread, but the ones I baked on parchment paper kept their shape. Use a fork to flatten each ball. Bake for 15-20 minutes, until edges are light golden brown. Let cool on cookie sheet for 5 minutes before carefully transferring to a wire rack to finish cooling. Once cookies are cool, melt chocolate chips in a small bowl. Dip the edge of each cookie into the chocolate and set back on the wire rack, over a pan or parchment paper to catch any mess. 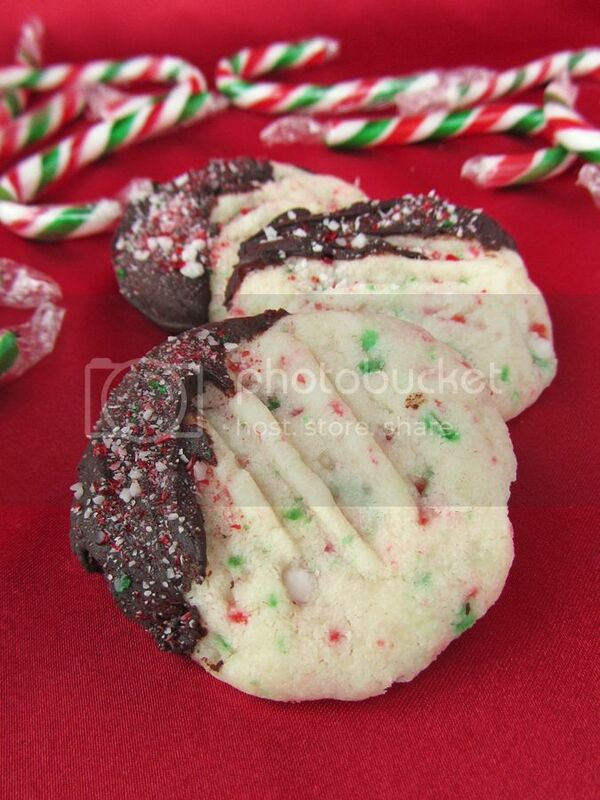 Sprinkle crushed candy cane over the chocolate. Let chocolate harden before storing cookies in a container.